I broke up with my desk. I removed it from my classroom without a single thought about it. It served no purpose and I had no emotional attachment to it. So, breaking up was not very difficult. I almost feel heartless with the lack of emotion I have about getting rid of it. Who just tosses a desk to the curb as if it has no purpose? To make matters worse, I replaced it with a media cart and a metal organization shelf. 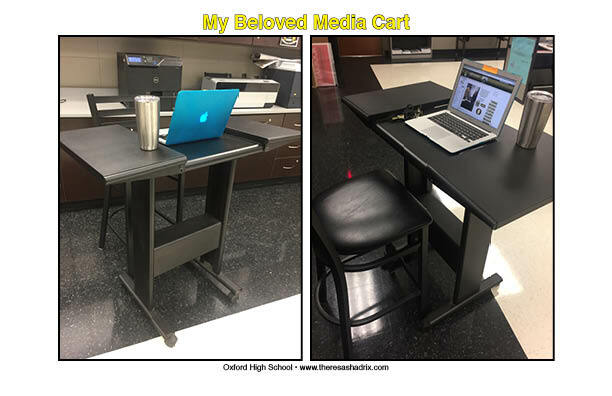 I sometimes imagine my desk peering into my classroom and becoming downtrodden over seeing me with my media cart in such educational and organization bliss. However, to be honest, my desk stressed me out. I stared at it and was overwhelmed by the stacks of papers and random items that students gave me. I once opened the middle drawer and found a back scratcher that was in the shape of a small hand and tiny pink toothbrush. Why were these items in my desk? At some point, they were handed to me as keepsakes and I tossed them into the abyss without regard to them. My desk had become a black hole. We lost respect for each other. When I made the decision to say goodbye, I had no instructional strategy or advice from an educational expert to guide me. I didn’t even have a hallway conversation at the tardy bell with a co-worker. I simply walked into my classroom and I could not stand the sight of it. My desk mocked me with its mountains of paperwork that I intended to file and the piles of lesson plans that I planned to develop. I often hoped that if I dug around, I would find a secret map that would lead me to a hidden treasure. But, in reality, all I found was a toothbrush and a small metal hand. I’m mature enough to admit that my desk was probably relieved that I made he first move in the breakup. After all, I forced it to hold a random toothbrush and back scratcher. Who knows what else I would do it in the future? Truth is, I rarely sit down in my day. I teach Advertising & Design and Yearbook. My students are active and I like to walk around and view their progress. On the occasion that I am siting, it is either at my classroom computer next to my students or a tall stool that I can easily move around the room with my media cart. Ah, that media cart. I’m not one to boast about relationships, but I will admit that I’m rather smitten with my media cart. It offers everything I need. My laptop fits perfectly on the top and I have room for a few papers. My media cart knows that if it offered me a lot of space, I would, no doubt, take advantage of all the space and overwhelm it with papers. My media cart moves with me. It is there for me. It simply gets me. You still need a working space in your classroom that is just for you. I have two spaces. My media cart is for my laptop and daily walkabouts. I also have a classroom computer that is placed with my students. Even when I’m sitting and working on projects, I’m next to them. Bless their hearts, they can't get away from me. So, make your space work for you, but don’t distance yourself from your students. If you can’t get rid of your desk, think about placement. If your desk is at the front of your classroom, then consider moving it so that it is part of the student’s environment, not a barrier against it. Also, while you still have your desk, write down the main storage you will need if you get rid of your desk. One by one, create space in your classroom for those items. Do not tip off your desk about the impending breakup. Play it cool. Clean out the drawers one at a time. You can slowly work your way into the breakup, instead of throwing everything on the floor and giving your desk the boot. If you sit down a lot, ask yourself if it is for you or your students. I mean it. This is a tough one. Teaching is tiresome. However, doing walkabouts often in your classroom keep your students engaged in the activity. If you sit a lot, what message are you delivering to your students? If you can sit among them, try it. Keep in mind, you may freak out your students at first. 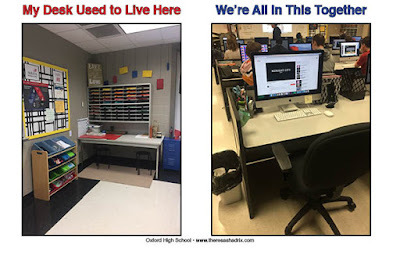 However, I promise you that the more you are engaged with your students, the less you will need your desk. 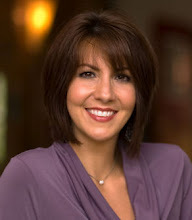 Theresa Shadrix is an IDEO Teachers Guild fellow. She encourages you to Defront your classroom and set it up for student-centered learning. "Do you not know that those who run in a race all run, but only one receives the prize? Run in such a way that you may win." On your mark, get so, go was the commanding charge that many of us had in childhood games. Racing as fast as we could go, we set out to not just run the race, but to win it. As the class of 2017 prepares for their race, I thought it was fitting to ask some friends about their life advice to graduating seniors. Congratulations Class of 2017! Now, on your mark, get set, go! "Don't let your education end with the conclusion of your formal studies, be it a high school diploma or your Ph.D. A fulfilling life is about learning new things every day. First, learn to use Spellcheck." "Take some time to see the country, the world if you can and enjoy a break before real life starts." "It's okay to change your mind and to not have it all figured out." "If it all doesn't pan out the way you planned, God has something better in mind. Trust Him." "Remember where you came from as you look to God for where you are going." "Live at home with your parents as long as you can. Really, I would say allow Christ to lead and guide every move you make. Depend on Him and relax in His mercy and grace." "Stay focused on your ultimate goal in life. & remove any distraction preventing you from accomplishing that." "Do not be afraid to fail. Through persistence and failure you will become stronger and more equipped for success." "Stupid mistakes are okay but always have a mindset to accept the consequences and fix them. Nothing last forever and everything will be alright in the end. There's nothing wrong with admitting that you are wrong. Always take an opportunity when it provides itself. Don't ever give up but know when something is worth letting go. The truth is always important and saves a lot of trouble in the future. Education is important but values and morals are more important . Always try something new because there's no telling if it can change your life. I've personally learned these so far in college and they're the only ones I can think of off the top of my head"
"Move away from home and learn who you are. Travel on a budget (it makes it fun and you can travel more). Plan for your future financially. Continue meeting new people and making new friends. Put your phones down and really talk to people that are all around you. Lastly, love every bit of life and find someone that loves life and Christ as much as you do!" "Remember that only reason and science will bring you through." "Having knowledge is not the same has having wisdom. Wisdom is the ability to use your knowledge for the better." "Pick your battles, let God have control." "Use your knowledge to the best of your ability to excel in all areas of life. Stay clear of drugs and shady types of individuals. They get you in trouble. Wait until you are done with college to marry and start your family." "Don't be afraid to be a little lost. You don't have to figure out the next 30 years of your life next week, next year, or even in the next decade. It's ok not to know what you want to do or be. As long as what you want to be allows you to be you. Many successful people reinvent themselves at 28, 38, and 48 so don't be worried about being 18 and not being sure. It's important to understand that life is more of a journey than a destination, and it's ok to take detours, revisit the map, and change paths. You can't put the next 40 years in the proverbial GPS of "you" and follow it to a T. They'll be construction along the way, but that's ok... Breathe, smile, and be happy. You'll find your way along the way. " It's important to understand that life is more of a journey than a destination, and it's ok to take detours, revisit the map, and change paths. You can't put the next 40 years in the proverbial GPS of "you" and follow it to a T. They'll be construction along the way, but that's ok... Breathe, smile, and be happy. You'll find your way along the way. " "Try everything (unless it's drugs) that you're interested in." "Trust in the Lord with all your heart and lean not on your own understanding! And ALWAYS wear sunscreen!" "Don't register for 7:30am classes in college because you "got up that early all through high school and are used to it." It's objectively a terrible idea." "College is so much more fun when you know you'll be graduating debt free, with a degree in a practical career field with steady income. Risk taking is fine but you don't want to be financially irresponsible." "Just because something doesn't turn out the way you think it should, trust that God holds it and you and move on! not everything is easy, and just because someone else is doing something doesn't mean you have to the same. learn to love yourself and laugh at your mistake. take it one day at a time. and when you're late, you're already late might as well get breakfast too. " "As I overheard my college junior tell a 15 year old the other day " choose a career path doing something that will make you happy , it's not all about the money "
"Find something you love to do, and work hard to do it well. And GET A JOB...You'll feel much better about yourself if you are supporting yourself." "Be true to yourself. God placed you here for a unique mission. If you follow through you will always have a sense of belonging to a greater cause. You will find joy and purpose in the lessons you learn. The lessons serve you or teach you what you need to share with others. Live close to nature and remember the heavenly light that you will return to someday when your mission here is done"
"Follow your passion and do something you love. Adulting and working is hard enough...do something you love so you will be happy. Money isn't everything! You can't put a price on happiness and joy each day." "Keep your eyes on Jesus and get connected with like minded students if in college or not." "Keep in mind walking distance between classes and how much time you put between each class. Schedule classes wisely. Also, email professors a week before classes start to find out if textbooks are gonna be used in class." "Nothing in this life is free. Hard work pays off and so does networking! And high school is not the pinnacle of your life." "Consider other careers that doesn't necessarily need a 4 year college degree. Find and develop a trade!" "Ask yourself who you want to help. It will do a great deal in leading you toward a fulfilling future. And, don't wait until you have all the resources/money/answers. Just start with what you have and go from there." "Never let someone influence your decisions that doesn't have a record of success! In the work force be kind and respectful to all people no matter their position there is no difference between the janitor and the CEO when it comes to respect!" "You can't say, "Read the Bible and follow its words. However, you can tell them to see faith, peace, strength, and joy." "The medial tasks you take seriously and do your best at pay off. There is always someone watching." "Pick a career that involves something you love spending time doing! Something that you will be excited to get to everyday! You don't want to dread your day everyday!" "Stay focused on your future don't let anyone sway you to get off your path. Get more education on your career.and keep steady"
"Always try your hardest even on things you dislike. Even go out of your way to accomplish things. Employers watch for the ones that strive to improve every day. Might get yourself a raise! Also to try to make someone smile each day, you never know if that one person just needed that." "No matter what life throws at you never, ever give up. What you think is the worst thing to ever happen one day may turn out to be the next day's biggest blessing. Hang in there and trust the Lord with EVERYTHING!" "Follow your heart. God will lead you toward your dreams and sometimes your idea of your dream won't be what God's idea is. Welcome the change. Don't let failure get you down. Remember, you're following a path less traveled. If it was easy, everyone would do it. The difficulty makes it worth it. Don't be afraid to take chances. Oh, and don't take any class before 9 a.m. unless you have to." "Stay positive and always hold the door open for the person behind you. You never know who they might be." "Tomorrow is for second chances. Not for procrastinating." "First-if you don't know Jesus-let me introduce you; Second-pray hard; Third-follow the Holy Spirit's leading as your life will be the BEST it can be...because you were created for a specific purpose." "You may fail once, twice or even three times. Just pick yourself back up and try it again. In other words, never give up because once you do, that's when failure sets in." "Know that you will make mistakes, forgive yourself and learn from them, pray and follow God's advice (even if it's not what you want to hear), be nice to everyone, you never know what they've been though or what they may be dealing with, if you don't love your job look for another one, always have a dog...they will always love you, just because everyone else is doing it, doesn't mean it's right, don't always believe what you hear, every story has two sides, if someone really loves you they will not be mean to you, don't settle for less than the best...wait on your Prince or Princess....last one... don't use run on sentences--lol." "When you find your true love, hold on and fight for what you want. But real love will always find a way of working out...even if it takes 25 years to find it again." "I have always told both of my boys that nobody said that life is fair but hard work will pay off and the world is theirs!!!" "Pay your bills on time. Save at least a dollar from every paycheck. Your word is your bond." "Set "Achievable " goals. Don't set yourself up for failure. One step at a time!" "It's not your failures that define you.. it's how you move forward after..
AND SEND THANK YOU NOTES!!! When you receive a gift, when you have a job interview.. when someone helps you"
"Your planner will be your best friend." "Let fear drive you to chase your dreams! Don't miss out on things in life for fear of failure or what others think. Learn from your mistakes, but never let fear keep you frozen in life. Let it push you!" "U DON'T have to figure everything out right now....Don't do what your parents or anyone else wants U to do but find your own passion and do what makes U happy....AND always be nice to everyone along the way cause U never know who will be your BOSS one day!!!" "Don't waste time and money not being 100% sure about what you want to do. At this point you should know what your passion in life is. If not, then you should sit down with s life coach to pin point what truly drives you. Don't be guilty of following someone else's dream for your life." I've done everything imaginably wrong as a teacher. I've called students by the wrong name. In the second semester. I've lost projects that needed to be graded. I've given assignments that flat out didn't work. I've worn my shirt inside out and didn't notice until 6th period. I've stared at a roomful of teenagers and could see that watching an episode of South of Sunset was more interesting than listening to me. I've given A's when students didn't deserve it. I've given F's when students did deserve it. I've meant to praise more, but allowed paperwork, emails, and phone calls to overwhelm me. I've allowed negativity to get the best of me some days. I've written lesson plans and, for educational assistance, Googled objectives, before/during/after, and rubrics and still not understood what I wrote. In all of my failures, doubting myself, and wondering if I'm doing any good at all, I remember one thing a former journalism professor told me, "It's not about you." That advice really fits for anything in life. Because, it really isn't about me. It's always about the students. It's why I choose to become a teacher. When I turned 40, I suppose you could say that becoming a high school teacher was my midlife crisis. Although I was working in my dream job as managing editor of Longleaf Style magazine for The Anniston Star, I left to teach high school. Some celebrated and some pondered my mental status. Well, I just finished my third year of teaching and I realize there are so many things I would have never learned in a newsroom. (No offense to my former co-workers as you may relate to a lot of these). I've learned that teenagers have dreams, but are sometimes scared to dream. I've learned teenagers may stare blankly at you, but they are listening. Sometimes, they just like to stare. I've learned that there are life lessons in everything. Literally. Just ask my students. I've learned that it's OK to eat lunch alone, but it's much better when you eat with a friend. I've learned to laugh at my mistakes. Because, honestly, most of the time the students are already laughing. I've learned to listen. I mean "Deer in the headlight" and "I'm not moving until you are finished talking" kind of listening. Sometimes, teenagers just need to be heard. I've learned that teenagers think they are the only ones who make mistakes and they need compassion, not condemnation. I've learned that F10 is your BFF when you allow students to choose the music. I've learned that when adults believe teenagers are all thinking about immoral and illicit things, some are really thinking about how they will eat that night or if the power will be on when they get home. I've learned that my "last nerve" is really longer than I thought. I've learned that choosing to be "too nice" is always better than the alternative. I've learned that my heart has multiplied. Because every time a student has graduated, a piece of my heart is released into the world. Every new student has filled that empty spot and the growth continues. Selfie with some of my students at the 2015 Alabama SkillsUSA competition in Birmingham, AL. We pretty much rocked. 2017 Edit: I'm completing my fifth year of teaching and I could also add that saying goodbye to students is one of the most difficult encounters in the journey. However, learning about their adventures and moments of the transition from teen years to young adult is so rewarding. Thanks for reading. Have a blessed day! In one brief moment, I realized that all of the questions I had about my new journey had been answered. God’s reply wasn’t in words, but in a gut-wrenching feeling that I was right where I needed to be in that moment. I could barely breathe, much less talk. The more I tried to contain the lump in my throat, the harder it was to hold back tears. There had been many times when I doubted myself. I wondered if I had made a mistake of leaving a job as a magazine editor, which I loved, to venture into a career that I knew nothing about. At 40 years old, I became a high school teacher. And, in my 40 years, I had never encountered a 16-year-old pleading for me to not cry. I looked around the room at the other students who were holding back their own tears. Each of us desperately tried to avoid looking at the empty chair in the classroom. But, it was there and it showed us no mercy. Just a few days earlier, the orange chair embraced life as she casually took pictures of herself on her computer. 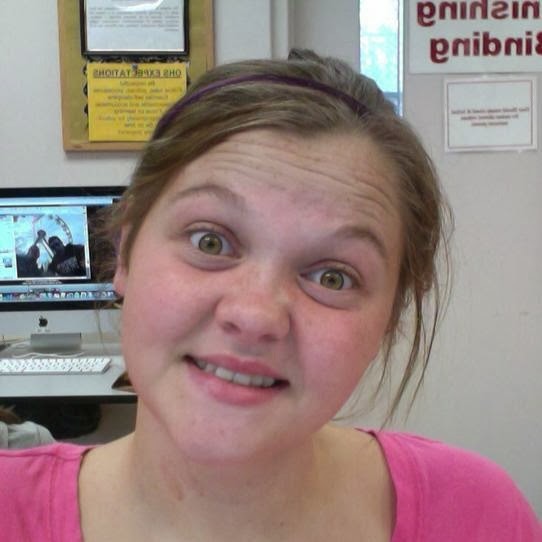 Wearing a pink shirt, she took a few pictures of herself on her classroom Mac computer before the bell rang. One was silly and one was sweet. So fitting. Her big eyes had a way of taking hold of your soul. Even when she was being mischievous, looking in them left you powerless. She was sitting in that orange chair during the first weeks of school when I called her name and asked her to meet me in the hallway. She had lied to me about something the day before and, as I told her, lying was something I couldn't tolerate. Caring about her meant I had to write her up. It was my first lesson in teaching. It's not about being mean, but it is passing on life lessons to young people. She will never know that I didn’t feel prepared to teach and that she was the first student I had to formally discipline. She will never know that I didn’t even know how to complete the discipline form. She will never know that if I could go back in time, I would spend every moment in class letting her know that I did, in fact, care about and love her. I would beg her to not go out on a late night ride with her friend. I would plead with her to have mercy on me so I didn’t have to hold back tears when talking about her death to her classmates. I would beg with her to not leave that chair empty every day. No one really prepares you for dealing with the death of a student. But, God did prepare me. When I was able to talk, I asked the class if they had ever heard about the stages of death. I asked if anyone had ever even talked to them about death. "No one talks about death, Mrs. Shadrix," one student whispered. In that moment, I realized that when I was a young woman and changed my major from journalism to social work, it was God. In that moment, I found myself pulling out of my memory, Elizabeth Kubler Ross and the five stages of death from her groundbreaking book, 'On Death and Dying." It was God. I realized that the brief time I spent working for Alacare Home Health & Hospice prepared me in some way for that moment. It was God. In that moment, I realized when I left the world of social work behind me to take a dream job at The Anniston Star and Longleaf Style magazine, it was all God. In that moment, I realized becoming a high school teacher was all God. In that moment, I stared at the empty chair in my classroom and knew I would never forget the life that it once supported. I knew the pain of mourning is real. The denial, anger, bargaining, depression, and anger are all real. Day in and day out, other students fill that empty chair now. Stories about that mischievous girl, who made everyone call her "Tha Boss" are told. Sometimes there are laughs and sometimes the words trail off. Questions of why are still asked. I try not to ask why. I only imagine that now, instead of sitting in that old orange chair in my classroom, she is sitting next to a throne and her angelic eyes are now seeing Him. It is God. In memory of Brittney "Tha Boss" Bonner.